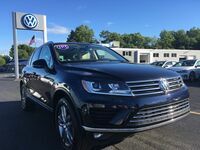 There are a lot of crossover SUVs on the market today, but few offer the modern styling and precision that you find in the 2015 Volkswagen Touareg in Ramsey NJ. When you are looking for comfort, the latest technology, and good looks, it is worth your time to test drive a Touareg. German engineering at its best, these crossover SUVs are the perfect mix of space and efficiency. Starting with this vehicle's truly impressive-looking exterior, the 2015 Touareg comes standard with an aerodynamic body and confident stance. Clean horizontal lines in the grille and headlights work with simple and eye-catching tail lights. Excellent handling is combined with a powerful 3.6-liter V6 engine that offers an impressive 280 horsepower. Smooth acceleration is perfected with the Touareg's eight-speed transmission, while the powerful V6 allows for easy towing. When you drive a Touareg, there is no adventure too long. It makes driving into the fun experience it was always meant to be. Test Drive the Spacious Touareg Today! Sitting inside the 2015 Touareg, the driver and passengers are instantly greeted by the latest technology and precise German styling that makes any ride both comfortable and entertaining. A first-row LCD screen works easily with Bluetooth connectivity and an eight-speaker audio system. Four interior power outlets make it simple to keep electronics and media devices charged and ready to go while on the road. Maps are not needed with the Touareg's impressive voice-activated navigation system that gives drivers the confidence they need to hit the road in style. Tough road conditions are made easier with features like daytime running headlights that work to keep passengers safe inside the Touareg's spacious and high-tech interior. If you are interested in taking the Touareg for a test drive, give our experienced sales team a call or schedule your appointment easily online. Our team of automotive experts are always ready to answer any questions you have about our large inventory or the quick and simple financing process here at Joe Heidt Motors in Ramsey NJ. We look forward to hearing from you!